A mobile robot should be able to analyze what it is seeing in real time rate and decide accordingly. 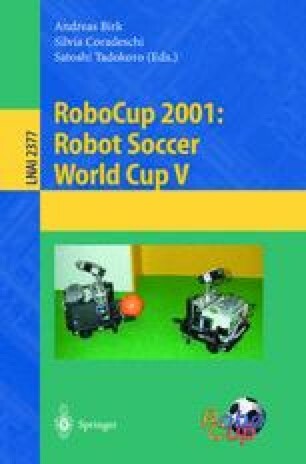 Fast and reliable analysis of image data is one of the key points in soccer robot performance. In this paper we suggest a very fast method for object finding which uses the concept of perspective view. In our method, we introduce a set of jump points in perspective on which we search for objects. An object is estimated by a rectangle surrounding it. A vector based calculation is introduced to find the distance and angle of a robot from objects in the field. In addition we present a new color model which takes its components from different color models. The proposed method can detect all objects in each frame and their distance and angle in one scan on the jump points in that frame. This process takes about 1/50 of a second. Our vision system uses a commercially available frame grabber and is implemented only in software. It has shown a very good performance in RoboCup competitions.